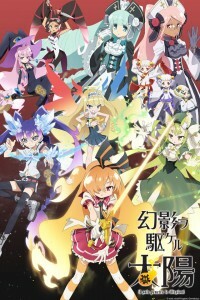 Il sole penetra le illusioni~ Day Break Illusion is one of the latest additions to the mahou shoujo genre this summer. Despite how much I sometimes complain about this genre being one of the dominating forces in the anime world, I can’t argue that it also includes some fantastic series; Madoka Magica and Magical Girl Lyrical Nanoha come to mind for me. It also includes some god-awful titles at the other end of the spectrum, which I will refrain from mentioning to avoid tempting any curious minds out there to taste the horribleness. The first thing I noticed in Day Break Illusion was the animation. The animation was fluid, and the fight scenes at the end were really well made. It does a great job of setting different moods throughout this opening episode, with the bright and vibrant colors for the first half giving way to dark, gloomy, and downright intense animation as the episode picks up the pace and things start to go down. Needless to say, I was glued to the screen when things turned dark. As for the story, as I mentioned before, everything starts out as another typical slice-of-life anime, with the lead heroine, Akari Taiyo, going to work at the local fortune-telling business in town. It turns out her late mother was a great fortune teller, and Akari means to follow in her footsteps using a set of tarot cards her mom left to her. Things in this anime were a little confusing at first; for starters it is difficult to assess how much magic exists in this world. I mostly question this due to an incident involving the large vine growing between Akari’s room and her cousin’s. However, as things progress, I find myself asking more questions rather than getting answers. This isn’t helped when we also meet the remainder of the cast in passing as Akari unlocks her special powers from the tarot cards, which brings up more mysteries and questions but also adds some excitement and promise for future episodes. Overall, while Day Break Illusion starts off a bit weak, things really begin to accelerate as the pilot goes on. I can only hope this anime keeps up the momentum and begins cluing the viewer in to the bigger picture of what’s going on.